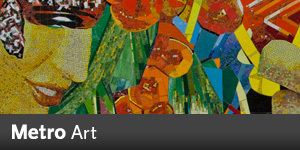 The Art Guide was updated in July 2011 and includes images of all of the artworks in the Metro transit system. It is a perfect complement for self-guided tours and features a system map, artist information and brief descriptions of the artworks. A hard copy of the pocket-sized guides are available by request. Please call 213.922.4ART or us, and include your name and mailing address in your message. Los Angeles: Through the Eyes of Artists , produced in celebration of Metro’s award-winning art poster program, features the full collection of colorful travel destination posters created by over forty Metro-commissioned artists through 2017. Download the Poster Series Summary .